In the spring 2016, the History Club sponsored three presentations, one of which was a panel discussion relating to research and careers in history featuring Drs. Jenny Thigpin, Lawrence Hatter, and Frank Hill. 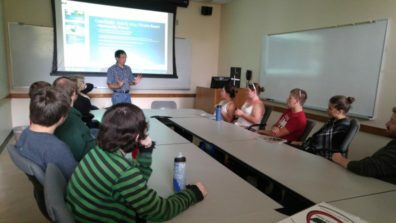 In April, the History Club hosted a pair of talks, one by Dr. Michael Delahoyde, from the WSU English Department on the true history and background of William Shakespeare. 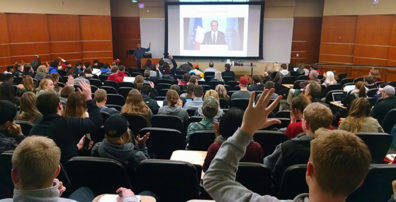 The second was a point–counterpoint discussion about whether the American or the French revolution that had the greater impact on world history, as argued by Drs. Lawrence Hatter and Steve Kale, respectively. Dr. Ray Sun spoke to the WSU History Club on “Commemoration, Celebration, and Politics,” Looking at how American presidents from Reagan to Obama have invoked memory on the D-Day landings to shape our collective memory of the event and use it to inspire support for their present-day political agendas. 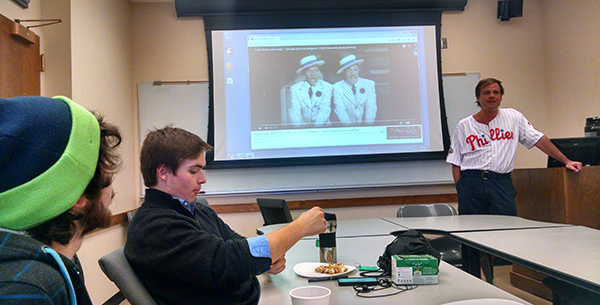 Dr. Frank Hill (Phillies jersey) talked to the History Club during the October baseball playoffs about “Music, American History, and Take Me Out to the Ballgame.” Club members dined on peanuts and Crackerjack during the presentation. 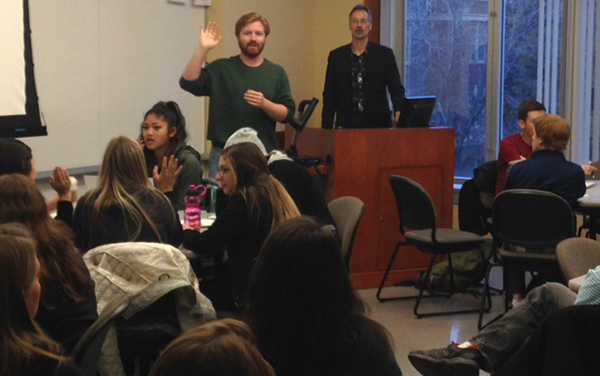 History Club president Kevin Schilling called more than 40 attendees to order prior to Dr. Charles Weller’s November 2015 presentation on the Holocaust.